On Thursday September 8th 2016 you are invited to spend an unforgettable evening with acclaimed Palestinian author, academic and activist Ghada Karmi as she launches her latest book, ‘Return: A Palestinian Memoir‘ (Verso, 2016). The event, jointly hosted by the Ireland-Palestine Solidarity Campaign and Academics for Palestine, will take place in the Ballroom in Wynn’s Hotel, 39 Abbey Street Lower, Dublin 1 at 7pm. Entry is free. 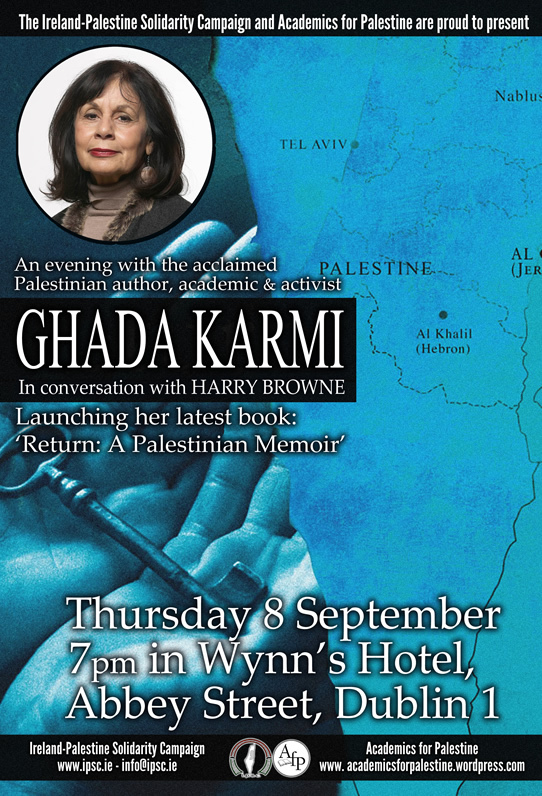 Ghada Karmi will be in conversation with well-known academic and journalist Harry Browne, and there will be time for questions from the audience. PLEASE JOIN & SHARE THE EVENT ON FACEBOOK HERE. Copies of the book will be available for purchase on the evening and the author will be pleased to sign them. Having grown up in Britain following her family’s exile from Palestine, doctor, author and academic Ghada Karmi leaves her adoptive home in a quest to return to her homeland. She starts work with the Palestinian Authority and gets a firsthand understanding of its bizarre bureaucracy under Israel’s occupation. Organised by the Ireland-Palestine Solidarity Campaign and Academics for Palestine.